Dogs and cats get fancy houses, so why not birds? 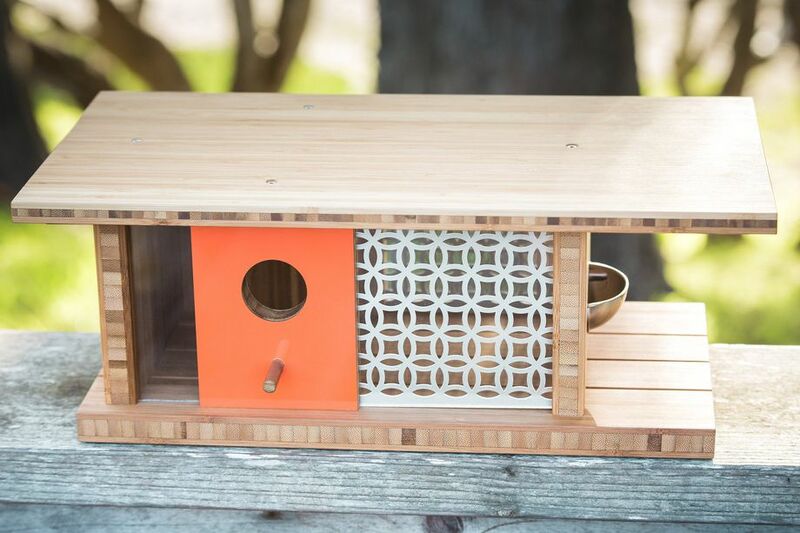 Drawing off the vernacular architecture of the traditional birdhouse is a collection by Sourgrassbuilt, a Santa Cruz, California-based company whose modernist miniatures are as appealing to humans as they are to our avian friends. The designer Douglas Barnhard finds inspiration in midcentury works by Frank Lloyd Wright and Joseph Eichler, while bringing a bit of his hometown’s surf and skate culture to each creation. The Sunnyvale, for example, is a flat-roofed abode made from bamboo with an orange laminate door with a peephole and perch, a geometric metal screen, plus a metal birdseed trough. One can almost picture an empty kidney-shaped pool filled with skaters beside it. Other birdhouses include the Sunset Modern, featured in Sunset magazine’s October 2016 issue, which boasts a sloped, overhanging roof and planters for succulents, as well as the Living Wall Bauhaus, a simple cuboid box with a flat gray top and a side wall that can be planted with succulents.